“What happens with respect to North Korea can affect Iran, and what happens with Iran can affect North Korea.” This statement, issued last month by U.S. Secretary of State John Kerry, underscores the Obama administration’s understanding of the North Korea-Iran connection. North Korea’s nuclear weapons and Iran’s purported nuclear ambitions are the subject of constant speculation by Western pundits. However, the connection between the two is often overlooked. Although Northeast Asia and the Middle East are home to different geopolitical realities, the resolution of tensions on the Korean peninsula will almost certainly influence calculations made in Washington and Tehran regarding the Iranian nuclear program. North Korea’s recent bellicosity provides the semblance of erratic behavior, but underneath its provocative rhetoric lays a rational and strategic plan to challenge the status quo of economic sanctions, isolation, and containment that has been Washington’s standard operating procedure for dealing with “outlier” or “rogue” states that have credible deterrents against military attack or invasion. North Korea “acts crazy for a purpose,” according to Stratfor Global Intelligence. “Pyongyang behaves like it’s looking for a fight, but it doesn’t want to start a war it knows it can’t win. It wants to appear volatile to gain concessions from stronger nations.” Presumably, North Korea seeks recognition as a legitimate nuclear weapons state for the enormous geostrategic leverage and economic benefits that can accompany nuclear weapons status, as evidenced by India. “What happens with respect to North Korea can affect Iran, and what happens with Iran can affect North Korea.” This statement, issued last month by U.S. Secretary of State John Kerry, underscores the Obama administration’s understanding of the North Korea-Iran connection. Clearly, Washington does not want Iran to take away the impression that developing nuclear weapons and conducting a belligerent foreign policy can lead to greater international legitimacy. Thus, many policymakers in Washington contend that recognition of North Korea’s nuclear status would bode poorly for Western efforts to deter Iran from continuing its enrichment of uranium. Undoubtedly, the Obama administration’s words for North Korea are intended to reach an audience in Tehran, too. Pyongyang’s decision to develop nuclear weapons in 2006 has changed the West’s geostrategic posture vis-à-vis North Korea. Today, a military invasion is not in the cards, given Pyongyang’s capacity to retaliate in a manner that could annihilate densely populated areas like Seoul, or even trigger a nuclear war in Asia. With Western-led regime change campaigns in Afghanistan, Iraq, and Libya looming large in the minds of Iran’s leaders, it’s not hard to see how Tehran might envy Pyongyang’s nuclear deterrent. 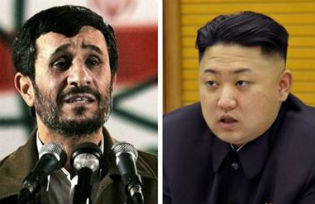 That said, as Iran—like North Korea—has relied on China to balance its hostile relationship with the United States, Tehran must certainly be taking note of the changing Beijing-Pyongyang relationship. China’s decision to shut off tourism to North Korea earlier this year and the Bank of China’s cessation of ties with a key North Korean bank indicates that such belligerent behavior risks jeopardizing deep economic relations with China. As China is Iran’s largest export partner, a heavily sanctioned Iran must be expected to carefully balance risks, as it does not seek to lose China as a buyer of Iranian oil and natural gas or push Beijing closer to Saudi Arabia. Moving forward, the Iranian regime will likely pay close attention to the tense situation on the Korean peninsula while seeking to acquire a deeper understanding of how the equation changes once a “rogue state” uses its nuclear weapons power to play hardball on the international stage. Given the Persian Gulf’s immense strategic value to the United States, the Obama administration would be wise to consider how the North Korea scenario could potentially replicate itself in this region. If Washington’s aims are to persuade Iran to discard its nuclear ambitions—whatever they may be—its current policies constitute failure. A recent in-depth report by the National Iranian American Council highlights how Washington’s sanctions on Iran have reinforced Tehran’s conviction to grow its stockpile of low-enriched uranium, add new and advanced centrifuges, and continue its production of middle-enriched uranium. According to the Washington Institute for Near East Policy (a spin–off of the American Israel Public Affairs Committee), Tehran has created a resistance-style economy that has, to a degree, effectively borne the brunt of sanctions. The U.S.-Israeli approach to Iran has only led the Islamic Republic to harden its position and threaten to withdraw from the Treaty on the Non-Proliferation of Nuclear Weapons (NPT) in the event of a military strike against Iran. Continued sanctions are unlikely to yield a change in Iran’s nuclear calculus and will only strengthen Iran’s resolve. America’s position vis-à-vis Iran is largely shaped by domestic factors, primarily the influential pro-Israel lobby. However, any politician in Washington who can call a spade a spade must admit that efforts to sanction, isolate, and intimidate Iran have proven futile in terms of slowing down Iran’s nuclear program. Only a sustained diplomatic approach toward Tehran—one that recognizes Iran’s legitimate interests—can deter a continuation of this dangerous standoff before it becomes too late. Failure to do so will only increase the probability of a bloody war in the Middle East or a hostile nuclear-armed state that could seriously jeopardize the stability of the Persian Gulf. The geo-political consequences of such a scenario are too terrible to contemplate. Shawn VL is a geopolitical analyst based in Tehran, Iran. Giorgio Cafiero is a geopolitical analyst based in Washington, DC.